Despite the fact that the Japanese and European economies are slowing down, the US demand is still pulled by strongly recovering jobs market. In addition, the trade talk between the US and China is approaching a temporary truce, whereas such progress has helped dismiss the global economic uncertainty to some extent. The Taiwan Institute of Economic Research (TIER) issued its most recent composite indicators for manufacturing and service, and the readings seemed poised for partial rebound; however, it is indeed too early to cerebrate just yet. 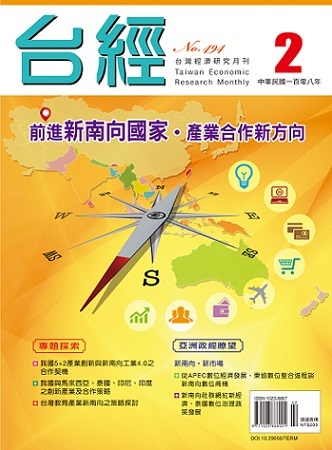 Taiwan's exports in January 2019 decreased by 0.32% compared with the same month of 2018. Regarding imports, Taiwan's imports in January 2019 increased by 6.85% compared with imports in January 2018. Exports and imports gave a trade surplus of US$ 0.91 billion on a y-o-y basis, the lowest value for the most recent 6 years. The "5+2 Industrial Innovation Development Program" is based on the "Industry 4.0" policy, which aims to build a sound industrial innovation ecosystem and accelerates Taiwan's industrial transformation and upgrades. In view of the implementation of the new southbound policy and consideration of local development and market demand, this article will summarise the outcomes of promoting industry 4.0 and collaboration opportunities with six countries in the first phase of the new southbound policy.